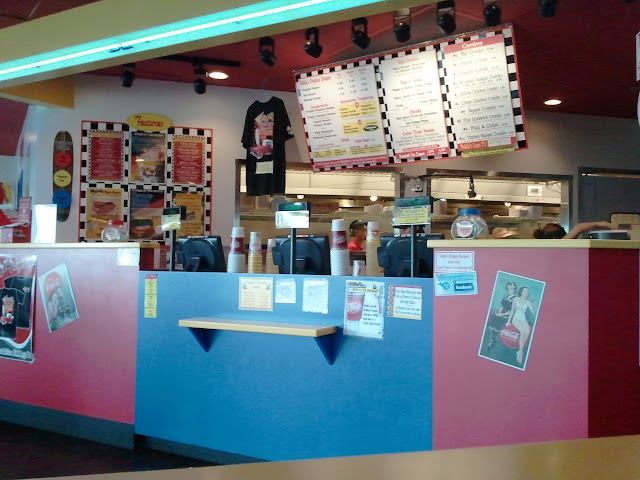 It's funny how a little indecision led us to da next burger joint. Da Wife and I had da classic "wea you like eat?" talk/fight. We was driving around town and couldn't decide wea - or even wat - we wanted to eat. Da Ward area was packed and so we headed towards Ala Moana on da freeway but for watevah reason decided to go straight and ended up at Kahala Mall. We wanted to try someplace new for us and low and behold, we ended up The Counter. 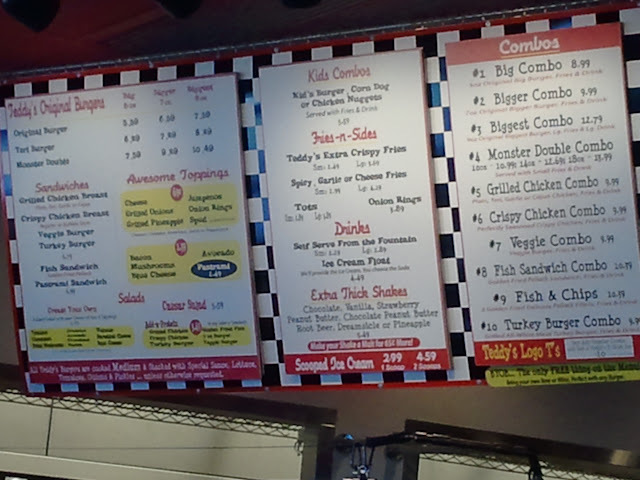 If you've nevah been to The Counter, you're given a "checklist" to build your "customized burger" along with a menu of pre-assembled burgers and classic sides for a burger joint. Build your own burger time! I was trippin' out wen I saw a particular topping.... can you spock 'em out? 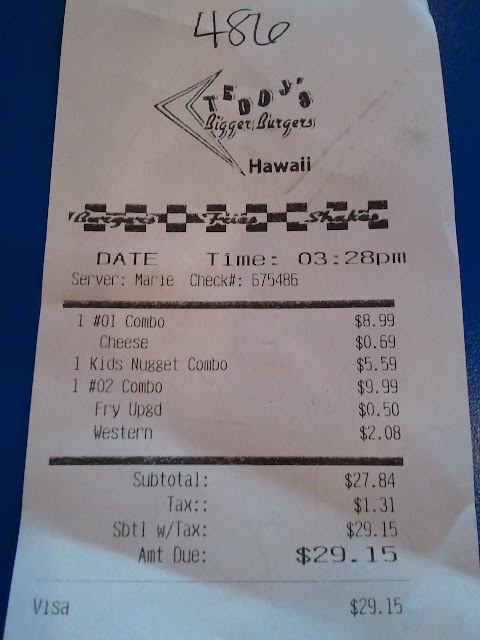 Da Keiki had da Grilled Cheese Kids Meal (comes with fries only) and I gotta say, was pretty ono. Da bread was buttery soft and fluffy and they nevah skimp on da cheese. Da pic makes it look like an "average" size sandwich but da bread was thick so it ends up being filling for any keiki. It was a toss up as to wat kine of fries we wanted: sweet potato fries, parmesan fries or da chili fries. Hint hint: They have a menu option called da "Fifty-Fifty" which gives you da option to get two choices of fries in a single full order. Our server recognized our dilemma and while da menu "Fifty-Fifty" didn't say, he said they can fifty-fifty our fries combo so we ended up with sweet potato and parmesan. Since I heard about da sweet potato fries, I had to try dat one and while it was "sweet" it turned out to be tasty as well. I can't say it went along with my burger but if you enjoy contrasting tastes, then it would be a good choice. Da parmesan fries is winnahs! I gotta warn you though dat it is fairly rich tasting and I was skeptical about it being mixed with rosemary and garlic aioli but wat a great mixture of ingrediments. Da Wife had da 1/3lb beef burger with pepperjack cheese, organic mixed greens, tomato, spicy pepperocini's, sauteed mushrooms and da chipotle aioli (I tink) on multigrain bread. I totally fo'got to ask her for sample so I cannot say how da buggah wen taste. I stepped it up a notch and really wanted to try something different so I forked ovah da additional $4.25 for an organic bison burger! I topped dat off with pepperjack cheese, organic mixed greens, tomato, fresh jalepenos, sauteed onions, applewood bacon and country buttermilk ranch on multigrain bread. There are choke options to choose from and you're allowed four free toppings, a sauce and bread. You can add more for an additional cost as well as ordering a premuim topping for $1.25 per topping as well. It's pretty neat dat you can make it a bowl or salad too if a burger isn't your passion. Da bison burger.... well, let me just say dat it isn't worth da additional $4.25. Da only difference I could tell, between any "regular" burger, is dat it was more jucier - not more flavorful - just more jucier. I guess it was a little leaner than beef but I honestly could not tell a taste difference. They also cook your burger to your liking as well. Da toppings were all fresh and tasty but I was disappointed dat their bread of the day, which was King's Hawaiian Sweet Bread, was sold out. We did have a semi-late lunch and they were hellah busy so we snooze, we lose. 🙁 I didnt' care for da country buttermilk as it was runny like watah instead of on da thicker, creamier side as I am accustomed to. In hind sight, I would have choose totally different unique toppings only cause I should have realized dat we wouldn't be returning anytime soon as we don't frequent da Kahala area. Plus, aftah paying for da bill, it was more of a one time thing instead of an occasional thing. Naturally, last night I saw online dat they accepted da ID Card (wea establishments offer discounts or freebies for dining in) and I totally didn't even realize it! In fact, I had it in my pocket at dat time and carry it around in da slight chance we might be going to a place dat accepts it but like a lolo, nevah even bother to check and we ended up losing a free appetizer/starter! For da size of da location, I gotta give it props for maximizing da square footage and still keeping a spaced out feel. It still has a "new" feel to it and da decor is contemporary and very easy to enjoy your meal in. They have a FULLY stacked bar with two tv's so if there's nothing to talk about, ESPN should be on. Da staff was very friendly and helpful and even provided Da Keiki with crayons and coloring paper. The Counter in Kahala Mall is worth checking out if you want a unique experience and a burger wea you really get to make (choose) to your specific liking. I don't have a Three and a Half Shaka rating so I bumped it up to Four Shaka's. Da toppings were as fresh as can be, da bread was excellent and da (bison) burger was a tad bettah than average in taste but again, it was very juicy so you ain't going to eat a dry burger unless you order it well done but then again, I can't say for certain as I don't order it well done. Plus they state da animals are humanely raised and handled if you look for dat kine stuff. Is it worth checking out? Most certainly.... but bring your plastic cause you might as well add some points to your credit card if you're paying dat much for (custom) burgers and fries. Rogah, it's dat time of year again wea men - some wahine too - start to giggle with excitement and for da 808, it has begun anoddah season of hoping and believing dat da boys in green will reach a bowl game, gain national recognition in da polls and win a conference title. We are defefinitely hungry for those but any one of da three would do. Latah dis evening, da Rainbow Warriors will hit da field and da 808 will be in full support.... well, except for those who no like da 'Bows.... and fair weather fans.... and bandwagon fans have yet to decide whether they like da Green Machine just yet. Whether you like or no like college football or da 'Bows in general, for da next three and a half months, bbq's are lit up, liquor sales will spike, Vegas (and bookies) are happy and tv's are tuned to ANY game on tv. Da battle is on like Donkey Kong. Well, no battle really but just two burger places Da Ohana tried out for da first time. I didn't plan on comparing da two but since both were burger joints, it just makes sense yeah? 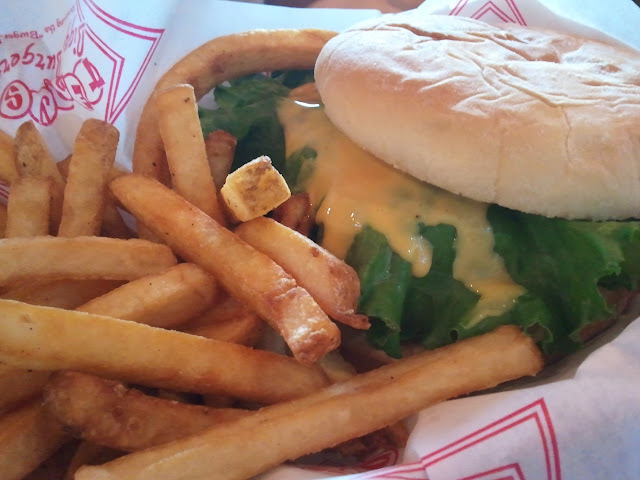 Da first burger joint we went to on a Saturday afternoon was Teddy's Bigger Burger at da Pearl Ridge location. Da front counter with a throwback feel. How throwback depends on how old you are. Da menu if you can read 'em. 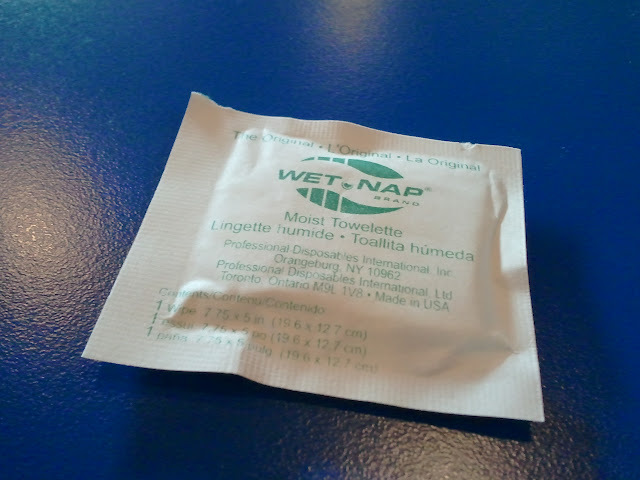 It says something wen you're given a wet nap with your meal. Da Wife had da "Big Combo" which is their base burger with their special sauce. Sorry, I had one shot to take da pic cause she was hungry. 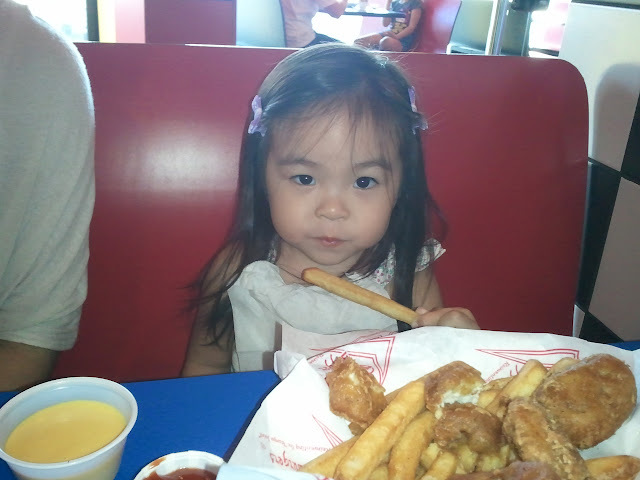 Da Keiki had da Kids Meal which was chicken nuggets and fries. 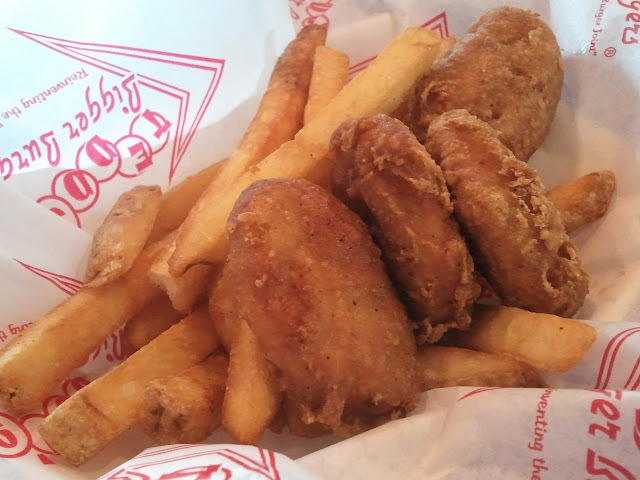 Da chicken nuggets was left in da fryer way too long as they came out crunchy and oily. Dis da look I got wen I wen cockaroach one fry from Da Keiki while waiting for my order. Besides sitting on hardwood bench type tables, da Pearl Ridge location was pretty roomy - more than enough to enjoy your meal with your own company. Da biggest saving grace was da décor wea it had a throwback feel. I guess it's a good thing I stay makule.... kind of. Unless you ordering a one pounder, no expect to kanack aftah a single meal. 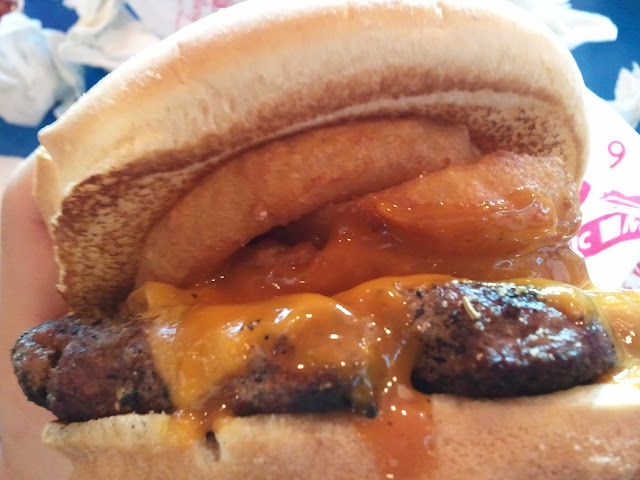 Da burger wasn't "wow" material but then again I had da western which was covered in bbq sauce and once covered in dat, everything tastes tangy. Da burger itself was "ok" and da bread was average. As mentioned, da fries were disappointing and there's no way to kanack from da portion size. Da price is a little on da high side for da quality received as I see it. Teddy's Bigger Burger is worth checking out if you want a step up in taste from Mickey D's, Jack's or BK as there are flavor differences but expect to pay for it as well - although the price difference isn't more than a couple of bucks. There are oddah menu items dat looks worth trying thus Teddy's getting da Three shaka rating. It's worth checking out.... at least once. 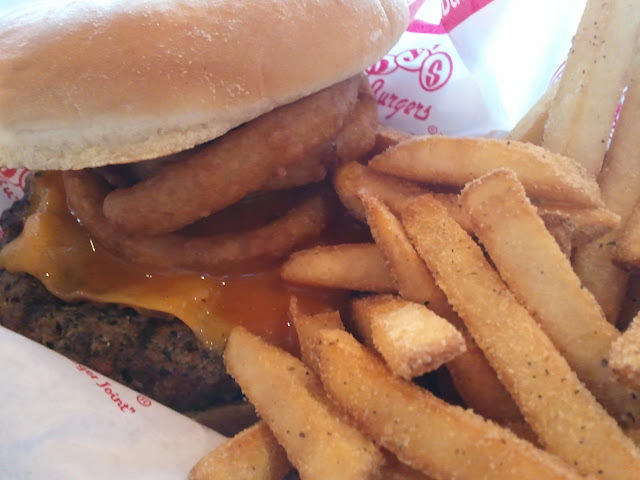 If you're a hamburger lover.... stay tuned. If you enjoy da shakanack reviews.... stay tuned. In da wake of da tragic skateboarding death of a 19 year old, da helmet law was revisited again by City Councilman Joey Manahan who sponsored two bills requiring skateboarders, 16 years and younger, to wear helmets at skateboard parks and other public places, such as streets and sidewalks. It died with a thud previously and da biggest reason why? Enforcement. Wat you mean you no like pass a meaningful law to protect keiki.... cause of "enforcement"??? Look at all da frickin' laws out there right now dat ARE NOT being enforced but it's still there! Can I just say zip lane, car pool lane, jay-walkers, illegal lane changing, smoking ban, texting/driving, sidewalk nuisance and da most recent move over law NOBODY does and ironic how dat got passed extremely quick yet it's still not enforced by da very people who pushed (demanded) dat law be in place - da list goes on and on and on. Instead of blaming enforcement, just say dat your "constituents" (translation: da people who "contribite" da most kala) say oddahwise. Wen da heck you guys go step up and grow some cajones?! So wat you no get reelected next session? Wouldn't you rather fail having tried to actually make a REAL difference rather than just keeping a perk happy position? Sorry but I stay fuming at dat kine excuse. I stay tired of people using enforcement as an excuse. How come gotta enforce if you NOT SUPPOSED TO DO IT? It's not just about passing or changing law but it's about personal moral as well. You know it's wrong so if you get caught, no cry about it! Let da Police, or whoevah is in charge of enforcing, do their job and if you get busted, then Man Up, admit it and face da consequences. And yeah in dis case, wat if da bill pass and there actually isn't an enforcement, at least da keiki has a fighting chance of trying to minimize a traumatic, heaven forbid anoddah tragic, accident. Da parents who fold too much and give in wen their keiki whine about wearing a helmet would have a powerful tool in saying "it's DA LAW! And if you no like wear, NO RIDE!" Accidents will happen cause guess wat, kids will be kids. If an adult wants to ride helmetless then so be it cause it's a choice you can make as an adult - just like it's a choice wenevah you decide to break a law. If you know it's wrong and you still choose to do it, then man up if/wen you get caught. If I was forced to wear a helmet, I would have still done those things at dat age but at least da odds of an increased injury is lowered cause kids will be kids and you not going stop "fun". No mattah wat protection you wear, if you hit anything at da right angle, you get chance of serious injury but let's get real, da odds swing more in your favor of it NOT happening with protection. Kids will be kids but if things are in place to help protect them until they can fully make their own decisions, then I'm all for it. But as an adult, da gloves are off........ or da helmet. Your choice.